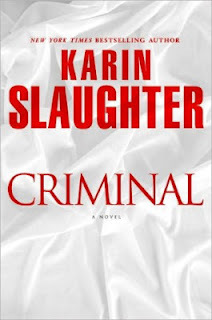 Maybe you caught the great interview with crime fiction author-par-excellence Karin Slaughter today on National Public Radio, part of NPR's traditional "Crime in the City" series. If not, you can read it at the radio website here, or even click the "Listen" button there to hear it, word for word. But stop! This is not a guy-focused book, even though the "emotional autopsy" it offers of dyslexic and scrappy investigator Will Trent rips open many of the part-healed wounds on this long-running character. Instead, CRIMINAL rocks back and forth between the 1970s -- when Slaughter's female leads Amanda Wagner (Will's boss in the "now" of the series) and Wagner's partner Evelyn Mitchell were among the handful of women pioneers in the city's rough, racist, and blatantly sexist police force -- and today, when Amanda's abrupt orders and detours forced on Will suggest she's punishing him. Just like that, he dropped Lucy like trash in the street. Maybe she was trash. Maybe she deserved to be abandoned. Because once the rush wore off, once the highs turned less intense and the lows became almost unbearable, what was there left to Lucy Bennett but a life on the street? With consummate craft, Slaughter opens a window into Amanda Wagner's past, her naive embrace of police work, her father's near-unbearable pressure to protect her in the force -- yet keeps the present-day female head of the Georgia Bureau of Investigation shuttered, mysterious, and nail-bitingly frustrating to Will as he staggers around the edges of a serial murder sequence that he knows far too well -- it matches what he's seen and investigated years before. Matches it exactly. So why won't Amanda Wagner let him work the case? Will Trent had never been alone in someone else's home before unless that person was dead. As with many things in his life, he was aware that this was a trait he shared with a lot of serial killers. Fortunately, Will was an agent with the Georgia Bureau of Investigation so the empty bathrooms he searched and the deserted bedrooms he tossed all fell under the category of intrusions for the greater good. This revelation didn't help ease his mind as he walked through Sarah Linton's apartment. Remember those fat novels that took you through generations of family in the Australian Outback? CRIMINAL has just as much emotional resonance -- in only two time periods, forty years ago and now. And you know the endless sexual harrassment faced by officers Rizzoli and Isles in Tess Gerritsen's books and in Patricia Cornwall's forensic epics? CRIMINAL digs deeper by calling up the vicious anti-women stances of "men's work" in the 1970s, when Civil Rights legislation allowed women a way to squeeze into the openings being demanded for men of color. Most of all, most important, CRIMINAL provides a tense rapid pace, sharp twists of plot, and characters whose hope of redemption depends squarely on whether the crimes taking place can be solved and the criminals successfully brought to justice. Even though the justice might be rough. I'll be re-reading this one. Karin Slaughter's just raised the bar for pulling the corruption and devastation of the past, into the blossoming of today's violent response. And for showing how it might -- if enough determined and vigilant officers work together -- be stopped. Book blog note: Watch for some Q&A with Slaughter here, during the week of August 13. If you've read CRIMINAL, add a comment to this post with pertinent questions you've got about the book and the author. If you haven't read it -- you have two weeks in front of you. Ready, set -- read! When HERON'S COVE opens, FBI art-crime specialist Emma Sharpe is choking a bit as she tips back a sample taste of a powerful "smoky single-malt Scotch" in a gathering on the Maine coast that includes an Irish priest and three brothers of her still-new lover, Colin Donovan. Colin hasn't yet arrived back in town, and Emma's aware that his brothers are still digesting the news that Colin's actually a deep-cover FBI agent himself. Mike, Andy, and Kevin doubt that Emma's a good choice for Colin, though. Skeptical, sometimes critical, their main interest in Emma seems to be whether she can do something about finding their brother, who hasn't been in touch for three weeks. Mike puts it succinctly to Emma: "I just think you have a knack for attracting trouble." A moment later, as he rises to leave with Andy and Kevin, he says to Emma in a tone that's almost an order, "If you hear from Colin, you'll let us know, okay?" In this suspense author's deft hands, it's no surprise that Emma tackles making sure Colin gets back safely -- but is less confident that she can persuade his brothers that she's not a danger to her own beloved, as Russian criminals, jewel theft, and deadly assaults arrive in the Maine coastal village. We gave a full review a week ago (click here), so consider this post a sharp (Sharpe!) reminder: It's time to ask the local or online bookseller to save you a copy when the books come out of the boxes tomorrow! 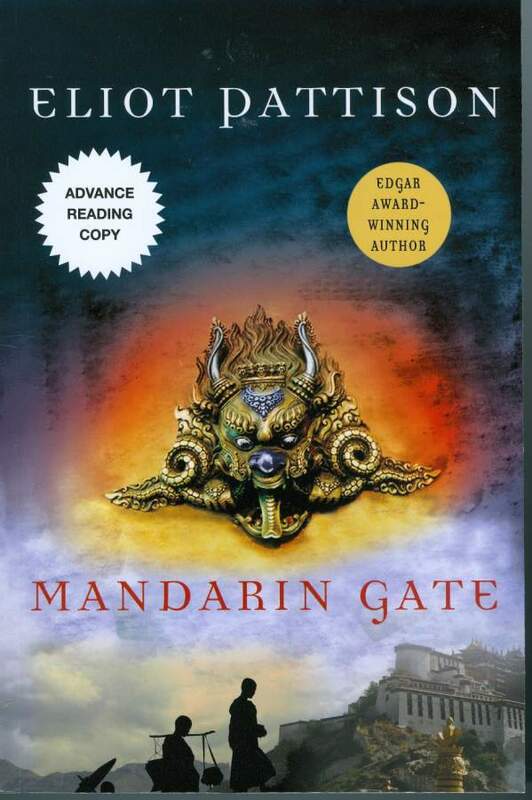 I won't give a full review until the fall, since Eliot Pattison's MANDARIN GATE won't be published until November. But I finished the "advance reading copy" (ARC) this weekend and it's one of the best books I've read this summer, with a shocking first chapter and an intense and complex plot. Dave and I are very excited that Pattison is visiting again at Kingdom Books a week from today (Sun. Aug. 5) at 7 pm to discuss his three mystery series. Pattison rarely makes any public appearances at all, so we're especially fortunate to be in the area where he takes his summer vacation. Hope you too can stop in! Mark your calendar for August 5, September 9, and October 20, and come meet these authors! ARCHER MAYOR: Autumn in Vermont: crisp air, red-and-gold leaves, and the newest in the Joe Gunther police procedural based in Brattleboro, Vermont, from Archer Mayor. What could be better? This time, Joe and his team, heavily relying on Willie Kunkle, extend their reach to Northampton, Mass., to track down a jewelry ring. With Joe and Willie both having long-standing personal issues, can the operation still succeed? PARADISE CITY is the 23rd Joe Gunther. NPR says of this New York Times bestselling series, "Even in beautiful Vermont, Archer Mayor finds shadows . . . and his detective, Joe Gunther, finds a way to beat them back." Catch Archer Mayor here on Sat. Oct. 20 at 2 pm and get your copy of the new book – as well as signed copies of any of the earlier 22 that you’re missing. KINGDOM BOOKS is your mystery shop, with thousands of the latest and the classics – from thrillers to classic mysteries, to espionage, “cozy” village mysteries, international intrigue, comic caper plots, even such early gems as Sherlock Holmes and “The Saint.” Call or e-mail ahead of time to reserve a copy of a book. Seating limited to 25. At a Kingdom Books author event, you really get to know the author. Kingdom Books, 283 East Village Rd, Waterford (half a mile from Route 2 – turn at the East St Johnsbury bridge). 802-751-8374. Beth and Dave Kanell, KingdomBks@gmail.com. Reviews at kingdombks.blogspot.com. Thanks to the Atria bus tour earlier this year, during which the publisher distributed a "sampler" of first chapters from about a dozen authors, I ordered the first two books by South African-born author Malla Nunn. And they were hard to find in first printing -- apparently they weren't printed in large quantity then. But whatever printing you can get hold of, these are worth grabbing. In this case, the series is definitely better read from the first book onward. Nunn's third book, Blessed Are the Dead, was released this June. A quick summary: Book 1 is A Beautiful Place to Die. Meet "English" police officer Detective Emmanual Cooper. He's good at the dance of politics and bias involved in his job -- which lets his partner in investigation, black Constable Shabalala, conduct much of the field work needed to assess the murder of an Afrikaner police chief. The murdered man's son explains Shabalala by saying he's "half Zulu, half Shangaan. Pa said the Shangaan part could track any animal, and the Zulu part was sure to kill it." That mingling of respect and racism gives an instant view of 1952 South Africa, with apartheid a way of life and social structure a force of determination for life and action. Nunn draws in the added awkwardness of the local Jew as well, a refugee and discard from Europe. But what makes her books sing is the dynamic and layered relationship of Cooper and Shabala, one that deepens and resonates through the difficult investigation. Flawlessly written, without a hint of "first book" to it, A Beautiful Place to Die goes to the top of my summer list of good reads. And Nunn's second book, Let the Dead Lie, goes even deeper. This time Cooper has lost his status as a white police officer and is in personal danger, with his career deep-sixed and the possibility of career redemption elusive and probably costing more than his integrity can afford. Although the publisher blurbs on the book feature only Cooper, it's his connections with Shabalala and other South African outsiders -- who are on the inside of their own groups -- that sing. And that, in the long run, offer him a chance, if he can be both courageous and clever, to again work for the police force officially. Nunn allows delicately timed insights into Shabalala's life too, pairing them expertly with Cooper's and portraying the charged and complex inner and outer landscape of South Africa with such intensity that I could almost catch the scent of the city -- and of the veldt. *Nunn now lives in Australia and is also a filmmaker. For her publisher's "interview" with her, click here. For a video on her filmmaking, click here and look for the VIDEO section. 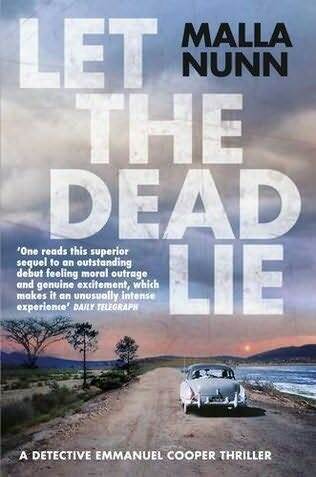 *In the US, Let the Dead Lie was issued as a paperback original. For a copy of the hardcover (the true first), you need to look at UK markets. *For another South African apartheid detection series, set in the 1970s but written earlier than Nunn's, see James McClure (review here). Yours truly, and the Atria author bus. 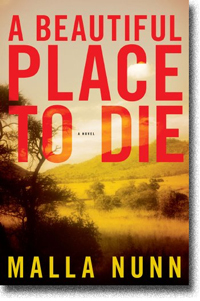 *And for crime fiction set in "modern" South Africa, try Jassy Mackenzie (review here). I try not to review books ahead of their release date very often -- it's too frustrating if the review makes you decide you want to read the book, and you can't get it yet! But I've been waiting a while to "do" the newest Sharpe & Donovan book from the top-notch romantic suspense author Carla Neggers, and it's coming out on July 31, just a week from now. So -- here we go! 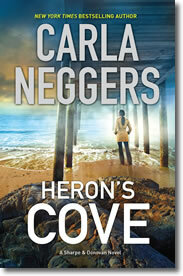 HERON'S COVE is one of a handful of books that have been on my "must read" list for summer. It's that whole idea of a good "beach read": a book where the suspense keeps you turning the pages (except for a little siesta when the sun's in your eyes), the characters are smart and quick enough to satisfy, and the complications are tangled just the right amount -- so you can guess a part of the solution to the crime, but not quite all. Plus, of course, in a Neggers book, there's always the question of whether the best "she" and "he" on the scene will be able to connect well enough to survive as a couple, after the crime's been solved. And Emma Sharpe, FBI art-crime specialist, is already on tough ground with her new love, FBI "deep cover" agent Colin Donovan. As the two of them arrive at their home segment of the Maine coast, Colin's moving Emma to the top of his list of what he's been missing while away. But Emma's already caught up in a tangle involving a Russian criminal, a collection of jewelry he's trying to repossess, and a London-based Russian jewelry designer, Tatiana Pavlova, who won't reveal why she's in Maine or what her interest is in the jewels. Emma's brother and grandfather, both in Europe, get drawn into the research and risks. And because the details involve "Sharpe family business," Emma can't reveal them all to Colin, even when he and his brothers are under threat. She flopped back onto the soft duvet and gazed up at the ceiling, knowing it wasn't just the whiskey that was keeping her in Rock Point. It was being here, in Colin's house. In his bed. "Colin, Colin. Where are you?" Her whisper sounded hollow, even bewildered. ... Her cell phone rang and she realized she still had on her raincoat and dug her phone out of the outer pocket. She answered without giving her name. "Hello, who is this?" "Hello, Emma Sharpe. It's good to hear your voice." Her breath caught in her throat at the Russian-accented voice of the man on the other end. ... "And yours," she said. A half beat's pause. "Your man is in danger." Mark your calendar, call your bookseller and reserve a copy for July 31, and oh yes, come meet Carla Neggers here at Kingdom Books in Vermont on September 9. Neggers is so well known as a national and international suspense writer that it's easy to forget that she lives among the Green Mountains, close enough to her beloved Maine coast, and an easy ride from Boston (the scene of another of her series of books, and the airport that launches her to Ireland, her third locale). More delights: a video trailer for the book, here. And, in case you've wondered what that new "social media" thing called Pinterest might do for you, here's the best answer yet: on Pinterest, a collection of images of gorgeous Russian jewelry, presented by Neggers herself. Wow! 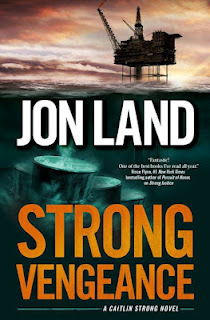 Jon Land's books have reached the "dozens" level -- but his Caitlin Strong series is only in its fourth title, ripping forward with action and strength and powerful roots in Texas. A martial arts pro and an associate member of the U.S. Special Forces, Land also researches his fictional landscape massively. And that, I'm guessing, is why he pulled Lone-Star hero Jim Bowie, pirate Jean Lafitte, and excerpts from the website Legends of America, Texas Rangers section, into STRONG VENGEANCE. It's almost too much -- Land's canvas for this thriller ranges from 1820 in a Texas bayou, to today's school-linked gun violence, and from Caitlin Strong's father and grandfather as Rangers themselves, to Strong's significant other, Cort Wesley Masters, fighting (literally) for his life in a Mexican prison. Oh yes, and there's a CIA strand in here, too. But let's start at the center: Caitlin Strong, gun maven par excellence and experienced conflict negotiator and resolver, might as well have one arm strapped to her side or one eye blindfolded. Why? Well, Cort Wesley's ridiculously long incarceration has Caitlin being the de facto parent to the two Masters boys, Dylan and Luke. Something about that situation keeps changing the way Strong makes her decisions and which actions she chooses. And her boss, D. W. Tepper, sees it, knows it, and handles a messed-up intervention by slinging her onto desk duty -- about as poor a match as there could be for Strong. Fortunately, events intervene and Tepper drags Strong along to an oil rig where mass murder has taken place -- revealing, en route, an unsolved problem from Strong's family's past. "But you, Earl, and Jim never did solve it," Caitlin said to D. W. Tepper after he stopped. "I'm starting to feel sick," Tepper said, instead of responding. "How about the rest of the story? What else happened that day on Galveston Island?" "Don't make me regret loosening that chain hitching youto a desk, Ranger." A Coast Guard captain named Lauderdale approached looking dour and unsettled. "We'd like permission to start of-loading the bodies, Captain," he said to Tepper. Strong and Cort Wesley Masters soon find their situations overlapping, as modern-day terrorism with long roots in the nation's past drives the threat level sky high. Who'll survive to parent those kids -- and why Caitlin is taking one of them to the shooting range -- turn out to matter just as much, as the team races to sort out the players and the next moves. This is a classic Land thriller, filled with fast-paced high adventure, skilled interventions, and a modern-day Ranger whose ability to solve a case has nothing to do with being a woman. But everything to do with being Strong. Extra goodies: Here's the start of the book, thanks to Land. And here's a great interview with Land, hosted by Deborah Crombie Hank Phillipi Ryan on the Jungle Red Writers' blog. Check out thriller writer John Verdon's analysis of why "we" read serial killer fiction -- those of us who do, that is. I like a couple of the points. Thanks, PW, for his post: click here. There are at least two dozen authors who are on my "automatic" list: I know that I enjoy their mysteries and/or crime fiction reliably, and I mark my calendar for when the next book by one of these is coming out. When I look over the list, I realize I've become a fan of, umm, character-driven dark mysteries in which someone has to dig deep into inner resources in order to solve the crime -- or even just to survive. Thanks to some bold authors who say "Hey! Read this!," I also find some gems that don't fit into any of my usual areas. 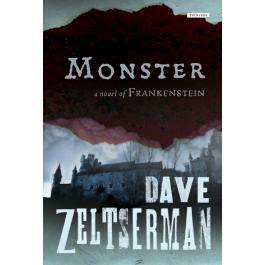 For instance, Dave Zeltserman writes some of my favorite -- although very dark! -- crime fiction, mostly set in the Boston area. But sometimes he zigzags off into horror, a genre I normally don't endure. Still, if it's by Dave Z, I get curious. So, a while back, I read and really, really enjoyed his horror parable (yep, really) The Caretaker of Lorne Field. And that led me to his newest title: MONSTER: A NOVEL OF FRANKENSTEIN. I bellowed again in rage, and stopped only when I realized that the leather strap that had been tied around my chest had broken. The slow trickle of strength that had been ever so slowly ebbing back into my body must have turned into a raging torrent over the last few days, for in my rage I broke that strap, which was something not even a wild beast could have done. I sat up with ease and tore apart the strap that bound my legs to the table as easily as a child might have torn a paper ribbon. But what is the true nature of this reborn Friedrich Hoffman? May he assert the compassion of his former self? Or must the evil of his re-creator stain him and turn him into perversions that mock his best efforts? Zeltserman kept me turning pages, aching for resolution. MONSTER came out this spring through the audacity and continued courage of The Overlook Press, which continues to prove there are still publishers who value diversity and outrageous creativity. The press even presents P.G. Wodehouse books. Diverse! Another such press, which I only discovered through agreeing to read its newest book, is MX Publishing. This firm is based in the United Kingdom and specializes in "NLP, Sherlock Holmes, Property, and Children's books." Turns out that NLP is neuro linguistic programming. I don't think it's connected in any way with the line of Sherlock Holmes books -- but I can't be sure. At any rate, MX Publishing boasts "a large stable of the best modern Holmes writers with traditional stories and short fiction through to fantasy and other unusual adaptations." And its newest is SHERLOCK HOLMES AND THE PLAGUE OF DRACULA by Vermont author Stephen Seitz. If that title makes you shake with uncertainty or despair, you're not alone. I wasn't sure I wanted to open this one ... Dracula has never been a passion of mine. Vampires are great in Charlaine Harris's "True Blood" series, but the original Vlad the Impaler? Hmm. Well, the first chapter hooked me. Who can resist prying into how Dr. Watson's relationship with Sherlock Holmes stressed his marriage -- when the take is spun at least 90 percent convincingly in that voice so familiar from A. Conan Doyle's classic detective fiction? And for the sake of more Watson-and-Holmes intrigue, I was willing to admit that Mina Murray -- the protagonist of the Dracula novel -- could actually have brought to Holmes the case of her vanished fiancé, Jonathan Harker. Seitz stays closer to Conan Doyle's "no spiritualist solutions" than the Holmes creator ultimately did, for Dr. John Watson tracks Holmes's insistence that the "vampire" effects must be explained scientifically. It's a great twist, and the team's journey to the hazards of Dracula's castle is well told, a great tale in classic form. Did it match 100 percent with an original Holmes story? Well, not quite. But it's so close that I could brush aside the occasional dissonance and revel instead in the adventure and solving the puzzles provided. It is a bitter, dark day for justice. We took photographs of the poor girl's desecration. Holmes measured every square inch of the tomb and collected several samples. We had Van Helsing in our very palms, and Lestrade despatched constables to bring him in. Yet we have been frustrated again. Oh yes, for those who are Holmes afficionados: Seitz has a brand new take on what actually happened at the Reichenbach Falls. So, that's a pair of quirky new novels to try out, if you're in the mood for something very different. Let us know which parts you enjoy most -- or whether one book or the other is creepy enough to keep you checking the door and pulling out the garlic and such. It's all in good fun, I think. Ever since he introduced Poke Rafferty in 2007, Timothy Hallinan has been winning fans for his alter ego, a travel writer in Bangkok. In 2010, the fourth in the suspense series, The Queen of Patpong, raked in an Edgar Award nomination. 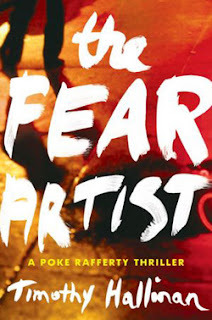 And now we have the fifth -- and maybe the best yet -- THE FEAR ARTIST. Things start out simply enough: A man being chased falls on top of him, on the sidewalk, and is shot and killed as he collapses. Rafferty hears three words from the dying man, and is abruptly surrounded by a phalanx of police officers and at least one "spook" -- government spy. Although he gets released from the scene, his troubles have barely started. He feels a bit of the old tingle, the little carbonated fizz of anticipation he'd felt all those years ago, when he first arrived, when Bangkok was just one jaw-dropper after another. When he spoke none of the language, when he might as well have been blind for all the sense the signs made to him. When he felt that the odds were fifty-fifty, each time he went down a new street, that it would be dedicated to holiness -- temple carvers, amulet makers, gold-leaf hammerers -- or hedonism -- bars, restaurants, flamboyant neon signifying the fall-off edge of his middle-class map of life. Except now the fifty-fifty seems to apply to him: On the one hand, he might be safe until the next block, even though he's being followed. On the other, he might be shot himself or, at least as chilling, tossed into jail as an American spy. And the idea of his family being threatened makes him even more vulnerable -- and more determined to get to the bottom of the stranger's death and its ramifications. Soon Rafferty is leaning on Arthit after all, and on a Russian, and to his utter astonishment, on a family member he didn't realize could or would walk back into his life. Even the weather becomes threatening -- and what Rafferty learns only increases the danger he's in, moment by moment. Soho Crime released this one yesterday, so if you're headed into summer vacation -- or trying to distract yourself from not being there! -- it's time to get a copy. You won't need to read the preceding four books -- A Nail Through the Heart, The Fourth Watcher, Breathing Water, and The Queen of Patpong -- but you'll probably want to. Why not? This is what summer is made for. Right, so maybe these aren't the blockbusters with the big publishing budgets behind them ... but each of these three could take you through a summer weekend, as they have for me. And the three are dramatically different from each other. G. M. Malliet writes cozy mysteries, but they're not the cat-and-tea typed -- they feature mostly gentle people who are puzzled by the intrusion of crime into their lives. She began with Death of a Cozy Writer (leading off her DCI St Just series), for which she won an Agatha Award (recognizing strong traditional mysteries). 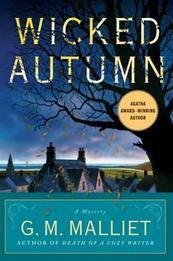 I picked up her 2011 book, WICKED AUTUMN (from Minotaur), which starts a different series: Max Tudor, vicar in a small English village, has a past that he's trying to escape. No, it's not an ex-wife or a crime; Max was an agent for MI5, went through a crisis of faith, and came out of it with a calling to lead a rural church. Although he regrets the way he sees criminal actions and the dark side of some humans, he cares intensely about his village of Nether Monkslip and is getting to know the residents more deeply. Their antagonism toward bossy, manipulative Wanda Batton-Smythe bothers him, but he doesn't have the confidence to interfere. Soon enough, he wishes he'd taken action, before a deadly turn of events. Hints at depth of character for Max and for Awena Owen, "the village's self-proclaimed New-Agey Neopagan, for want of a better description, add a light and pleasant fragrance to the crime-solving, which hinges -- ah, poor Max -- on the grubby and ungrateful side of a couple of characters. The book is a pleasant and engaging read, and garnered a lot of positive attention: recommended on NBC's Today Show, and nominated for yet another Agatha Award (2012). I look forward to this fall's sequel, A FATAL WINTER. See the author's website, http://www.gmmalliet.com, for more details and a charming picture of Nether Monkslip. If you're still thinking of Harlequin as only a publisher of steamy (yet straight!) romances, you've missed out on the MIRA side of the publisher -- which brings out a lot of lively thrillers these days. 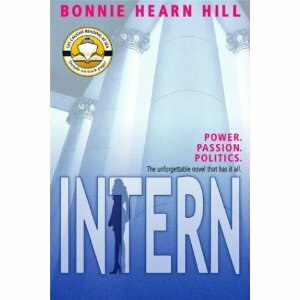 Michelle Gagnon (whose thrillers deserve *lots* more attention) started there; so has Bonnie Hearn Hill, whose political thriller INTERN (2003) cuts a swath between some seedy stories of California's legislators and the disappointing side of former President Bill Clinton. That's right, the "intern" in question is not the hospital type, but the political kind -- extremely pretty April Wayne, intern to politico Eric Barry, and as the book opens, missing and presumed, well, harmed, at least. Bonnie Hearn Hill provides a page-turner that jets from one voice to another, the senator, his wife, the other women in his life, and some twisted, nasty sorts that you don't want to meet on a dark night (but you know you might, which is why you're carrying pepper spray and took a course in self-defense, right?). I'll be looking for more of this author's thrillers -- you can see the list here, http://www.bonniehhill.com/thrillers.html -- but probably won't indulge in her latest novel, which is paranormal romance. 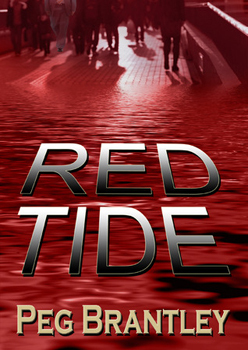 I picked up RED TIDE (April 2012) by Peg Brantley because I recently got acquainted online with the author and wanted to sample her work. The softcover looks like a self-published or print-on-demand item, although it has a publisher, Bark Publishing of Houston, TX. Whether that's actually Brantley herself, I'm not sure -- but RED TIDE is a book where I wished a seasoned editor had put her foot down on the first few chapters, which say "not quite ready for most readers." Fortunately, the pace picks up, the main characters -- "human remains" dog handler Jamie Taylor (I really like her), and FBI Agent Nicholas Grant -- have a good balance of haunted flaws and gutsy strengths, and the plot involves a lot of danger and risk, as well as at least two psychopaths. There's a medical aspect in the murders that's stretched a bit too far, and the inner workings of the criminals are a tad clumsy. But the pace is rapid enough and the twists so interesting that I kept reading, right through, and I'm excited that Brantley is bringing out another thriller this fall. This is the kind of writer who, once firmly in control of how to craft a dark and chilling novel, can surge ahead to very good work indeed. And you know, one of the big thrills of reading as many mysteries and crime novels as Dave and I do is: We want to spot the early-career writers who are going to give us work that rocks our world. Later this week, books from Malla Nunn, and a look forward at Michelle Gagnon's powerful "young adult" thriller, DON'T TURN AROUND. Plus a comparison of two very strange items, one from (oh yeah) Dave Zeltserman and the other from Stephen Seitz. What happens when a counterterrorism officer with a political science background in Stockholm turns her hand to crime fiction? For Kristina Ohlsson, the move was literally life-changing, as her three-book series of investigations featuring analyst Fredrika Bergman garnered awards and praise in Europe. Thanks to Atria (a Simon & Schuster publishing house), Ohlsson's books are finally arriving in the United States. The first one, UNWANTED, was released earlier this year, and it's a winner -- you can pick up an occasional awkwardness or loose thread that reveals this is a debut (with an impressively smooth translation by -- believe it or not -- Sarah Death), but the blend of crime-solving and investigative team friction is deft, the twists of the plot are rapid and intriguing, and the characters are unforgettable. That goes especially for Fredrika Bergman herself, the new civilian on a crack police team where each of the officers has reason to devalue the analyst's comments and suggestions. But Bergman, unskilled in shifting the balance of power within the team meetings, independently investigates a strand that the team is ignoring: the young woman with a sick dog who seems to have lured a mother away from her child during a routine train stop, so that a psychopath can seize the small girl. It's clear she didn't wander off on her own; her shoes are still sitting next to her bench on the train. Peder cursed the fact that he'd been passed over in favor of Fredrika yet again ... Even so. Hadn't Alex sounded confident that the case of the missing Lilian would soon be solved? ... So the Lilian case was not to be considered particularly major or important. Seen in that light, it was more understandable that Fredrika was going with Alex to interview Sara at home. It was actually a good thing that she and not Peder had been asked to go, because she was the one who needed to hone her skills, not him. I could disagree with Ohlsson's decision to give large chunks of narrative from the points of view of perpetrators, but it clearly raises the tension in UNWANTED. And by the time Bergman and her boss, Inspector Alex Recht, realize what lies beneath the crimes, the pace of the narrative is intense enough to interfere with the ordinary life of a reader. Luckily, those of us who read crime fiction regularly don't get upset when a book begins to cut into our sleep time (or even a bit of work time) -- instead, we celebrate, right? I'm celebrating finding Kristina Ohlsson's work. The next in the series comes out in the US in March 2013. Hurrah for good translations of Scandinavian thrillers! There are at least five more Olsson books already -- see the author's page within her agency's website. We've got more good books coming our way. YA Mystery Author Carole Shmurak: Guest Post Tomorrow on the "Other Blog"
I try to keep my hats on separate blogs -- after all, I have to take turns wearing them! -- but this time, there's no getting around the issue: Author Carole Shmurak is providing a guest post tomorrow, and it pertains to both mysteries (this blog) and "young adult" writing (the author blog that I host). So ... tomorrow, check out BethKanell.blogspot.com for Shmurak's post. Not familiar with her work? She co-authors the Matty Trescott series under the pen name of Carroll Thomas. 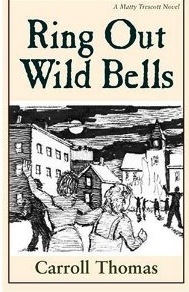 In her novel RING OUT WILD BELLS, teens solve a murder case -- in 1865. In her guest post, find out about the book's genesis, as well as the author's research and decisions. Actually, no, it's not a police procedural after all. And that's why THE JOY BRIGADE didn't suit my taste as much as the seven books that preceded it, which featured Sergeant George Sueño and his buddy Ernie Bascom, working for the U.S. Army in Korea's demilitarized zone (DMZ) in the scary 1970s, solving crime and doing their bit to ensure some kind of justice for the Koreans around them. His name was Hero Kang. He showed me the photograph hanging from his neck. It was framed in varnished wood and showed a much younger version of himself standing in full military uniform next to the Great Leader of North Korea, Kim Il-sung, shaking hands. Both men were smiling. Hero Kang told me that the photograph was taken in Pyongyang in the Great Hall of the People almost twenty years ago, after the end of the Korean War. "You must've been very brave," I said, "to receive such an honor. His round face grimaced. He changed the subject. The premise is interesting. But there were quite a few moments when I stopped and said things like, "Why wouldn't he wrap his feet in something?" Or "He thought he could do WHAT with his version of martial arts?" Or even "Doing that, while carrying a baby? Are you crazy?" In the long run, THE JOY BRIGADE is a tall tale, a wished-for adventure for an investigator who dreams of ending the Korean standoff, and seeing Confucian values and family affection knit together a divided nation. 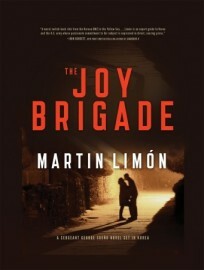 The thing is -- I really, really like Martin Limón's rough and friendly Army-based police procedurals (Jade Lade Burning; Slicky Boys; Buddha's Money; The Wandering Ghost; G.I. Bones; Mr. Kill; I haven't read The Door to Bitterness). So THE JOY BRIGADE doesn't suit me very well. On the other hand, Martin Limón is such a good writer that I'll keep a copy on my shelf, and hope that the next book in the series goes back to the ground of buddies in trouble together, solving crimes and restoring some measure of justice. Like, umm, yeah, Hero Kang. 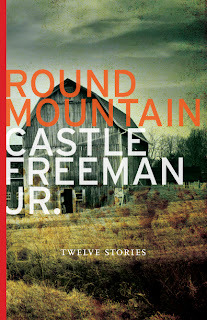 ROUND MOUNTAIN by Castle Freeman Jr.
We grow from where our wounds are -- I'm convinced of this. And after reading ROUND MOUNTAIN by Castle Freeman Jr., I'm ready to apply the same idea to small, rural communities. In this case, the community includes second constable Homer Patch and his gently, sadly, tenderly confused life. Married to a woman who acts out sexually, parent to a child who can't stand, talk, embrace ... Homer carries more losses than seems fair. And yet, so do the others around him. And like Homer, the other people in his circle -- the Captain, Alva, Clay, Raymond -- have reasons to mourn, but also reasons to feel very much at home, with people who more or less understand them. "See, what it is you're asking me," he said. "You want me to come here and, what, shoot some kid for using your shed to get in out of the rain. That's what it comes to. You want to make a lot of trouble here that needn't be. My advice to you is what I said: lock the door. He will move on, and you won't be bothered. There's no need to bring an army out here for something like this." "I don't want an army, Mr. Patch," Gretel said. "I only want you." Homer sighed. "Could I get a glass of water?" he asked. It is, of course, a mild ruse. Homer knows how to handle the situation, but he can't do it with Gretel looking over his shoulder. Still, as Homer contributes his quiet "handling" to local matters, there are deep currents swirling. Among the twelve stories in ROUND MOUNTAIN, Castle Freeman Jr. unfolds the silken threads and Kevlar ropes that bind community and the heart. I expect to re-read this whenever I can't quite make sense of life. Like calling Homer, re-reading the collection won't necessarily make things better. But it may provide a calm reassurance that's very much needed.